Monday through Saturday, 9 AM – 3 PM. 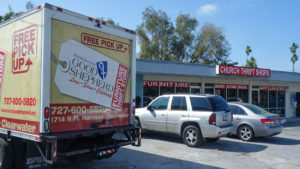 This store sells gently used furniture, household items, and some clothing given by households and businesses from northern Pinellas County communities. This thrift shop picks up donations of furniture and other household items for free and resells them at modest prices. Donations are also accepted at the store. However, this ministry is about a lot more than just furniture; it provides hope and community in a neighborhood that is hungry for both. Caring hearts and helping hands are always welcome. Please call (727) 600-5820 for more information, or use one of the forms below. Also check out our Little Thrift Shop in Dunedin on Main St.